I think the first engineers in the world were farmers. Had to be engineers. There is nothing on a farm that does not break, stop running, fall down, go amiss, tangle up, want to kill you, not cooperate, or wants to die on you. Fact. Farming has low profit margins, if not negative profit margins. So, thrift and economy are mandatory. Fix it yourself, make it yourself. Take it out of your pocket, or take it out of your hide, I always say. Not every convenient tool is close at hand. If every convenient tool is close at hand you are either an 85 year old farmer, whom has bought every tool known to man over a lifetime of fixing things, or you are well-to-do person whom likes to spend free time by being shat upon by various livestock. You know, the good life. If you are medium to borderline strapped for cash or if you have full on crossed that border, then you must be a Boot-Strap farmer. I claim this with pride, as I doggedly refuse to go into debt. I dumpster dive, pick up used 2x4's on the side of the road before the garbage man arrives. Same with old windows. Yes I am that crazy lady with the Subaru going through your trash pile. 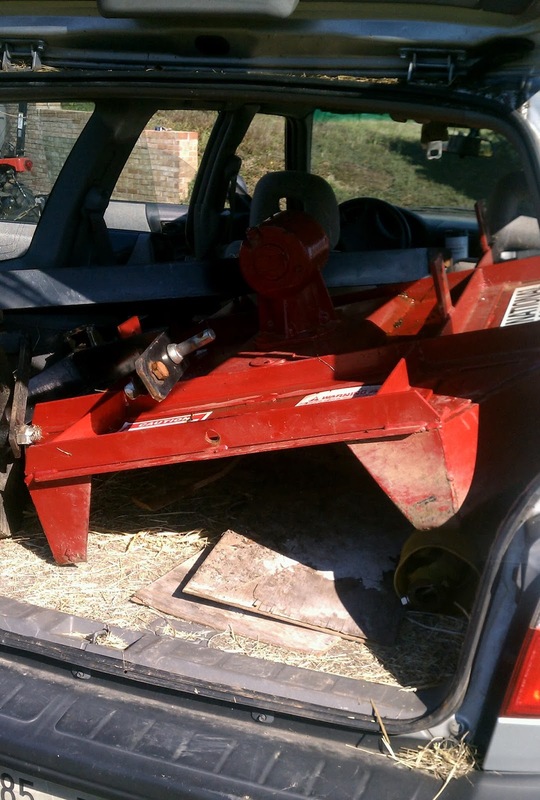 I shop classified ads for gently used farm equipment (means not broken, much). Yes you CAN fit a 4 ft bush hog into a Subaru. And it was darn heavy I might add. Most of the success at Boot-Strappin' comes from a skill that is tough to learn once you have lived a life replete with petroleum muscle in the form of tractors and machines, and easy access to cash to solve a problem. This skill is what is called "outlier thinking". It is the innate ability to break down a farm problem into the most simple, cost free, useful and sustainable solution. A person has to train themselves to think this way. It is the opposite solution, to the money solution. You have to think of what you could do to fix a problem if you had zero cash and zero mechanical advantage. Often the solution is wild, and off center, but you have to think this way and let it percolate to the top. Then you must embrace it, and get to work. Think of using what you already have, what you know you could trade for. My Boot Strap guru and mentor, has this outlier thinking honed to a fine skill. Hand him a problem, and watch that brain turn to create a solution from nothing. I give you Farmer Leaf, of Broadened Horizons Organic Farm in Pilot, VA.
Farmer Leaf's hand baler machine. 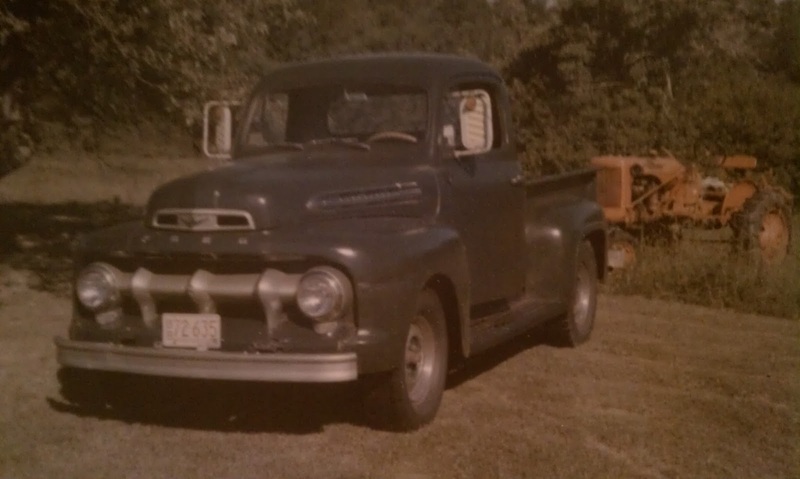 I've been on small farms in the foothills of Maine. I've been on small farms in the foothills of Tennessee. The barns have the same wood, the same horse collars and oxbows and yokes hang from the beams in the barn. The morning fog lays low to the hay until the sun rises and burns it off. Practical farmhouses sit in places close to their barns, so milking isn't a distant walk. Clotheslines are mandatory. It is possible to awake in both places, to the music of songbirds at dawn, with cold night air coming through an open window and streaming over your cheek, with the crisp smell of line dried linens and blankets. The sleep of a clean conscience comes for free in exchange work contribution on this farm. Guaranteed. Barn swallows dance over your head as you plow, mow, or rake, or windrow, be they Tennessee swallows or those of Maine the agile birds fly the same twisted daredevil loops. They know when fieldwork is about, and appear when the tractor is started, or when the horses are brought out. So well the farmers have their swallows trained, almost as though they can be taken for granted. The same mountains are in the distance, a summer gray green, that disappears in blue layers to the edge of sight. The ridge's shape is the same like "kicked carpet" (I wish I could remember who said that) that stretches over 1000 miles through the hardwood forests of Appalachia. Deep and green, and alive these woods restore and feed the spirits of those whom have learned to stop and be silent. The clay fields of the south give way to the glacier erratics and till soil of the north, where the boulders heave themselves skyward, birthing their massive smooth backs up through the soil with each winter freeze. The farmers are given gifts to be found with the plow, and stone boats earn their keep. No history of grandfathers has plowed any of these fields clean. One reads Mending Wall and knows what it means. The same practical, solid nature persists in these people, up and down the spine of Appalachia. It is a way of doing, a way of going, being efficient, knowing how to work. These things are valued, and the old folks pine for these traits and mourn their loss in the youth who have walked down off the mountain and gone into town, never to return. Who will cut my hay, and stack it in the barn? The corn is coming in, and the sweet corn picked in the morning cool is the best. I have cooking and sewing and knitting to teach, I am the fifth generation in a line of women to know these things...how can this die with me? A uniform is worn. From Tennessee to Maine there are work clothes, plaid shirts, practical boots; not the cheap ones, but the good ones that cost more and last for years. Aprons and skirts for the women. Clotheslines are hung with great dignity. The unmentionables to the inside lines, or the lines facing away from the road. Stains, tatters and rips drip dry in the bathroom over the tub, not fit for a public display of home keeping. Food has few ingredients, and strangers at their tables never go hungry. Soapy dishwater is dumped out on the rose bush. Mason jars line heavy shelves and make a patchwork of color. Springs bubble water, sacred water, out of rock hillsides and give rise to streams, and brooks and rivers. Water blesses these farms both windward and lee, and rain comes to Maine and Tennessee. The hillsides are swathed in smoky clouds, evidence of ample moisture, what do you wish to grow, they ask. Travel 1000 miles and you will still be home. I discovered a couple of days ago that my city bee hive had died out. Not good news these days. I had checked on it a couple of weeks ago, but had not opened it yet as it was well set up over the winter. I thought I had substantial comings and goings of field bees this spring but when I checked on things early this week, it was bad news. To top it off, wax moths had eagerly infested the valuable non-foundation drawn comb frames. The horror! I am not a fan of the use of chemicals, and my freezer is packed full. Normally one would put the frames in the deep freeze for a few days to kill the bugs off. So, I thought I didn't have a solution for this other than to let the frames and comb perish. 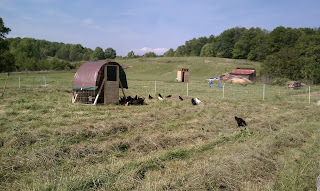 It struck me like a bolt from the blue, a free association from another bit of homesteading skills. Why not fumigate with dry ice? Now that I have googled it, I find that this is not an uncommon solution. But, the idea came into my own head as a result of the grain storage learning I have. If you want to store whole grains for months without insect damage, store them in a 5 gallon bucket with a lid and a chunk of dry ice. When the ice melts into pure Carbon Dioxide gas, it displaces the oxygenated atmosphere and suffocates the pests in the grain. Huzzah! The process is ongoing, even as I write. The larvae are exiting the comb and dropping to the bottom of the clear plastic tote I have the CO2 fumigant in. It is taking quite a bit longer than I imagined for the larvae to perish. They must have very well oxygenated bodies, or a very low metabolism. A few ants inside the box dropped within 15 minutes of sealing the lid on. The sweet part is that CO2 is not a haz-mat. It can displace the air you breathe, so it should be used with caution and not in an enclosed space. Never touch any part of the dry ice with your bare skin. Very simple setup; infested wax frames, large plastic tote with tight lid (or some sheet of plastic big enough to seal as a lid), packing tape, dry ice (handled with gloves only). Put the frames in the tote, put the dry ice in, seal with tape, except for a small corner to let pressure out of the tote. The dry ice melts and turns directly to gas (sublimation) and displaces the atmospheric air. Voila! I plan on keeping it sealed overnight so I can be sure to get the larvae. I am not sure what happens to the eggs or pupae as they appear to be in stasis somewhat. But, we will see. A bag of dry ice from the grocery store. Wear gloves. I can put this comb directly into strong hives and the worker bees will clean up the mess. Wax comb creation is a tremendous effort for the bees, so to cut their work short by giving them instant comb is a great idea. Frames and Dry Ice packed in clear tote. I must admit it is with wry pleasure that I watch these little maggot like larvae drop to the bottom of my tote! I think the part that I am happiest about, was that I had divine inspiration all on my own on this one. I connected the dots of past learning. I realize that it is the victory of hundreds whom have already had this original idea before, and wrote about it on the Internet. But, I did this without google. What if there was no google. As my dad always says "Learn everything you can, about anything you can. You never know when something will serve you. "﻿ This is, in fact, sublime. Folks, it is officially over. Yes, my journey into maple syrup in TN is done for 2013. 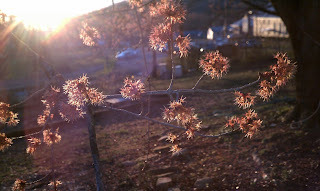 The maple trees are now blooming and sap is no longer running. I can hardly describe my happiness at discovering the massive ancient maple trees at the farm. While growing up in MA, I had tapped maples with my father. I never thought it possible to do such a thing so far south, in such a warm climate. It is possible and we succeeded. There is a history of maple sugarin' in this part of TN. Most would associate maple syrup with Vermont or New England, but I am stubborn. I mail ordered some taps from Canada. Spiles they are properly called. Stainless steel, the old fangled type that have hooks to hold buckets. Nowadays many sugaring operations use tube lines and trees are interconnected to the downhill container collecting the sap. Not for me. I have to keep things as simple and critter proof as possible. I used the method proven by my dad. It takes a spile, a short section of tubing and a milk jug for each tap. 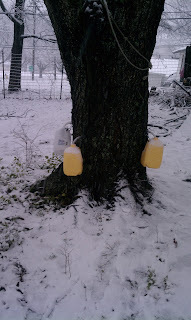 We collected just over 16 gallons of sap from the few trees we used. This tree is over 30 inches in diameter and supported 4 taps. For those of you tempted to be more natural than natural...DO NOT USE ELDERBERRY BRANCHES as taps. Elderberry stems contain a toxin akin to (or may be exactly) cyanide, and this is not something you want to ingest after concentrating it down by boiling. Don't poison yourselves folks. All along the back of the fence line are many magnificent ancient maples. The sap flowed well for a couple of weeks. I watched the weather for days above freezing and nights below freezing. The tell-tale was the sap weeping from new woodpecker holes in the bark of the maple trees. It was time to tap. 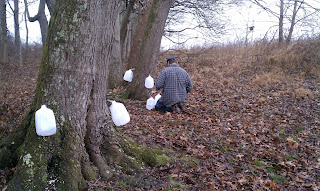 We knew we were not going to make a commercial effort at maple syrup production. Most small farm efforts are best served by staying small. We saved up 16 gallons of sap and began to reduce it down. It took most of a weekend and probably far more stove gas than I care to account for. 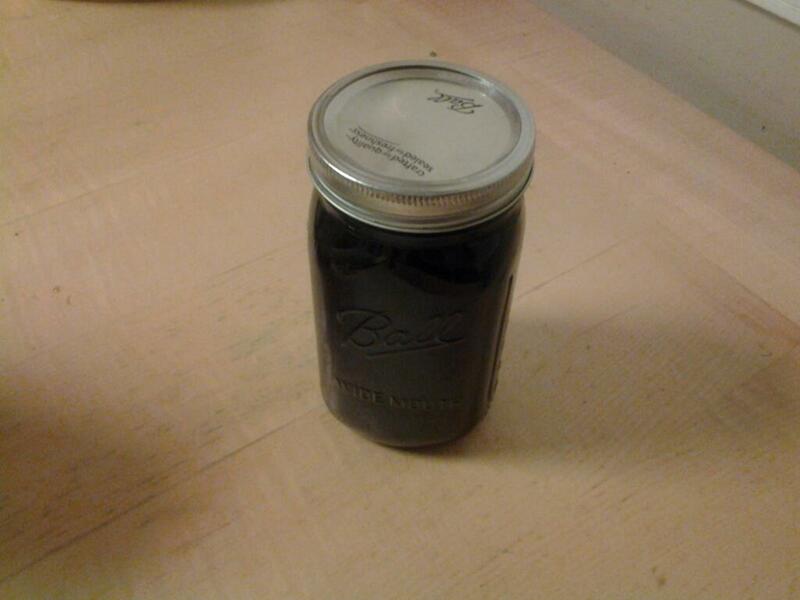 But, the result was a quart of the finest tasting, but dark grade of maple syrup. It is a fine treat for the children (and adults), whom are on their third maple syrup and pancake breakfast with this batch. It is a fleeting sweet indulgence, in the most improbable of locations. Things go out of balance. Things go awry. 2012 was a tough year on the farmstead. Here at LJF we experienced a February where the weather turned to 80F and stayed there for 2 weeks, without rain. All this just after having planted 500 white spruce Christmas trees. We bucketed rainwater, having no well, and having none of the customary cool, damp TN February weather, to 500 thirsty spruce seedlings. Needless to say, this heat stress slammed them. We lost most of that planting. It is depressing, as every single one of these trees was planted by hand. Not a small task for us. We had worked for days to do it. It was taken out of our hide. The loss of the crop was keenly felt. So it was buckets, buckets, buckets. Every day, every day, every day. Didn't work. One does not plant conifers in the dead heat of summer. This was a false summer, but summer weather it was. The ticks absolutely thrived in this weather. It is possible that they barely went to sleep for the winter in 2012. 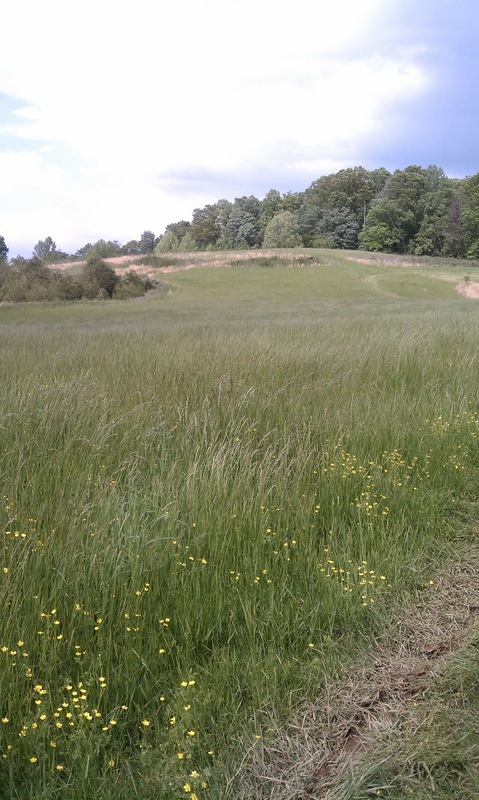 The spring was spent with regular tick checks on all of the human and animal inhabitants of the farm. It was nothing to close the day with a tick check and find 4-8 ticks on each person. I have already written about the rodent issue in a previous post. The infestation of rats in the fields preceeded our arrival when we bought the place. Our first effort at reclaiming part of the hayfield by bush-hogging revealed many rodents leaping from under the tractor in all directions. I have to imagine that the local ecosystem is bountiful enough to provide for such a population, and that predators are few. However, when we inserted our will into the equation, things went badly. The invisible legion (I have to keep calling it that) crawled from below ground to wreak havoc on everything I did. William and I apportioned our labor such that he would build farm structure, and I would tend to crops. I was maddened by the removal of seeds from the ground in my garden plantings. The destruction of vegetables at the point of harvest made me crazy. I have already detailed this here so I will spare you the repeat. 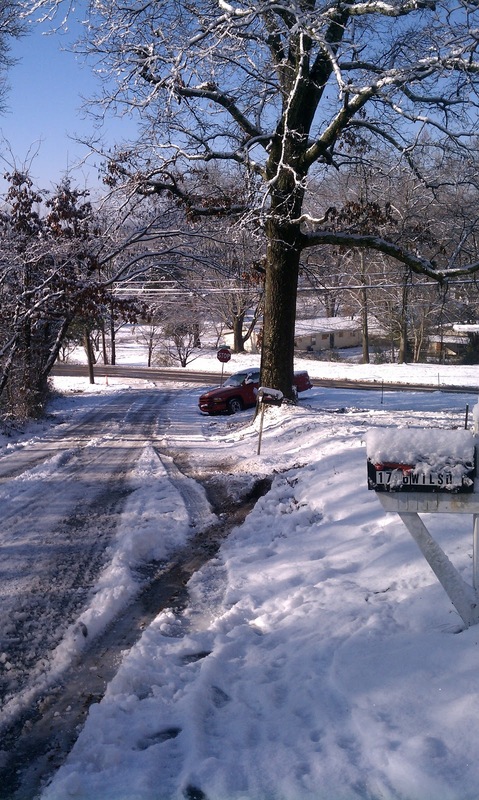 2011-2012 was the year without a winter in my opinion. But, this year is shiny with hope. We have had snow, we have had sub-freezing temperatures. I know if you are reading from northern states that you will now sniff at me. For TN though as with the rest of the country, I think a "traditional" winter is important (for the environment and for people, whom are part of the environment), and it is just the thing we are losing during this epoch of Global Weirding. As weather oscillates from the old pattern to the new pattern, whatever that turns out to be, we may see our customary farm plans fall apart if they do not take these changes into account. However, resiliency and playing the averages has its limits. My dream, and it is a small one, is that this cold weather will kill off some ticks, starve out some rats, and restore normal for one more year. Welcome to farming.